I’m turning to the expert community here for some help with diecutting on our 10x15 Chandler & Price. We bought a die from a professional die-maker, and told him we were going to use it in our press, which he understood just fine. We’ve been trying to die cut, but having no luck. Either it’s punching too much and we can’t pull the cut paper out of the press because the cuts are sunk into the tympan, or we can’t cut enough to pop the pieces out. We’ve tried adjusting the impression, but even a hair’s width difference is too much one way or the other. It’s a 4x4 inch die with 6 different circle type cuts coming out of it. Anyone have any advice? This is possible, right? Don’t a lot of people use their C&Ps just for diecutting? you need to cut against a bare steel plate. 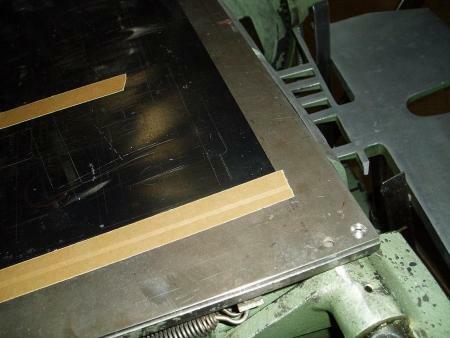 adjust platen height so there is a very thin makeready. start low so as not to dull the rule on your die. go slow. each face of the platen bolts is approx .010”. It sounds like you are saying, when the impression is too light it doesn’t cut all the way through the paper. Does your diecutting die have ejection rubber around the cutting rule or spring punches inside the circles? They push the paper away from the die/form. Gripper fingers, or/and string, a rubber band, fishing line strung across the gripper bars (away from the cutting rule) will help pull the paper away from the die. One trick is to get smaller pieces of .030 steel (stainless seems to work better for this) figure out where the cut will go, tape the steel in that area over a regular tympan (pull packing first of course). Then set your gauge pins in the usual manner outside of where the steel is. I’ve used this with great effect in a commercial shop on a handfed Kluge..
Another (if you have a full size jacket) is to get some good double faced tape and paste some quads right on the jacket (though this doesn’t make a very adjustable setup). Also, if you are having just one or two weak spots, you can either makeready in the traditional sense under the jacket, or use transparent tape (Scotch brand seems to be the best for this) on the offending sections—however more than two layers will result in paper dust pilling in the cut with eventual cutting issues—it also needs to be renewed every three or so thousand impressions.